The game play is easy to pick up- so the game is hard to put down! 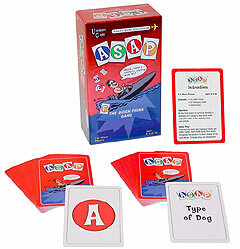 You'll have two decks of cards: one deck of letter cards (A to Z) and one deck of category (types of dogs, names of movie stars, etc .) Flip over the top card on each deck. The card on the left is B. The card on the right is types of dogs. Got one? Bulldog? Boxer? Be the first to yell out your answer and keep the cards. The most cards win the game! Fun for the whole family, it's snazzy, sturdy packaging is perfect for suitcases, glove boxes or anywhere else you'd like to bring along the fun. For 2 or more players.